Home / Score / MDY WARRIORS 2018 Invitational CHAMPS! ; defeat Rochelle Zell 81-55! It all comes down to this. Chicago and New York have always had rivalries, but nothing could compare to the rivalry that might start on this fateful Sunday in November. The championship game of the Cooper Invitational has always been special. We’ve seen madness, ejections, and even quadruple over-times. We expect that this year would be no different as the number one seeded Magen David Yeshiva Warriors face off against the number eleven seeded Rochelle Zell Jewish Academy Tigers. The excitement at tip-off was unreal as both teams were very prepared to take home the prestigious Cooper Invitational Tier I trophy. Only time could tell who would bring it home in 2018. The game began with the Warriors’ Albert Nsiri hitting a fast-break layup to put them up early 2-0. Rochelle Zell had no trouble breaking through MDY’s press, but could not convert. The Warriors then came down and hit a layup from Ray Jajati to extend MDY’s early lead. They extended it further with another Albert Nsiri fast-break layup. Rochelle got themselves on the board, though, with a layup from Brian Silverstein. The Warriors responded with a layup from Teddy Cohen, but the Tigers got a layup from their star Sammy Vayngart thereafter. The Warriors then went on a tear getting a three and a layup from Michael Natkin, a layup from Ray Jajati, and another Nsiri layup to make it 17-4. The Tigers needed to come back and come back fast to keep up. That they did with a layup from Lee Farkus to cut their deficit to eleven. The Warriors came back with another Ray Jajati layup to make the score 19-6 Warriors lead. The Warriors went on to score two more layups, while the Tigers got one to make the score 23-8. Ray Jajati would close out the quarter by hitting a pair of free throws to give the Warriors a 25-8 lead at the end of quarter one. The second quarter began with Lee Farkus shortening the Warriors lead by hitting a pair of free throws. Michael Natkin, in response, knocked down a three, but Brian Silverstein hit one to match it. In response to that, Ray Jajati and Albert Nsiri hit threes and Michael Natkin hit a jumper to make it 36-13 Warriors lead. Sammy Vayngart got some momentum right back for the Tigers after hit a beautiful fadeaway jumper. Albert Nsiri then hit a layup for the Warriors to make it a 38-15 game with three minutes remaining. However, to make things even more difficult for the Tigers their star player went down with a nosebleed after getting hit in the face on a made layup. Lee Farkus shot in his place and hit his free throw to make it 38-18, Warriors. Albert Nsiri had a free throw of his own and a layup to put the Warriors up twenty-three points with a minute remaining in the half. They wouldn’t stop there as Michael Natkin hit a layup to extend MDY’s lead even more. From RZJA, Brian Silverstein hit a free throw to bring the Tigers a little bit closer and made the score 43-19 at the half. The second half started off with another hard-fought Ray Jajati layup, but Brian Silverstein hit a layup for Rochelle Zell to match it. The Warriors came right back down, though, and Albert Nsiri hit a layup to give the Warriors a 47-21 lead. Brian Silverstein decided to take a chance with a three and was rewarded while Ari Rosen hit a layup to shorten MDY’s lead to twenty-two. Edmond Antebi hit a layup for the Warriors, but the Tigers came back and hit two layups to make the score 49-30. It seemed as if the Tigers were quickly gaining some much-needed momentum. Ray Jajati got some of that momentum back with a layup, but Brian Silverstein matched that on the next possession. Then Albert Nsiri, one of MDY’s stars, came down, was pushed, and was injured on the play. This caused Michael Natkin to fight back with some punches and was ejected shortly thereafter. This game was getting intense halfway through the third quarter. Ray Jajati would hit a free throw, but Lee Marcus would match that and more with a pair of free throws for the Tigers. Chants were soaring through the air and no one in the gym could hear themselves talking. The Warriors would gain back some momentum off of an and-1 layup and made his free throw to make it 55-34 Warriors. Even though MDY was up by so much, it did not feel like a twenty-one point game. This was anybody’s game. Albert Nsiri scored yet again on another fast-break layup, but the Tigers would strike back with a layup from Niv Ostroff. Nsiri struck another time, this time with a pair of free throws. That would be the last score of the quarter and would end it with the Warriors leading 59-36. The fourth quarter began with two layups from the Tigers to make it a 59-40 game. The Warriors hit a layup, but the Tigers had an and-1 layup with a made free throw from Ostroff. The Warriors would jump right back in it, though, with two free throws from Ray Jajati. The Tigers would come down and hit an insane layup from Evan Dayan to make the score 63-45. Albert Nsiri then responded for the Warriors with a free throw and a layup to make it 66-45, but Brian Silverstein would hit a three in response. Nsiri wouldn’t let that faze him as he would go on to hit another layup. Jajati would then go down and hit a free throw to make it 69-48. The Tigers would go on to hit a free throw to get a little closer and cut their deficit to twenty. Nsiri would hit another layup, but the Tigers’ Lee Farkus would match it. 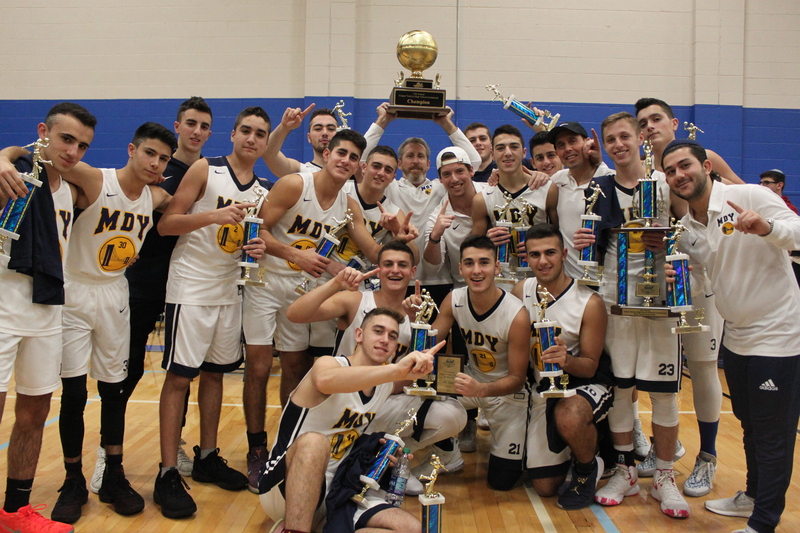 Jack Mosserri would hit a free throw for MDY, but Brian Silverstein would hit a jumper to make it a nineteen-point game. Nsiri would hit another two free throws and a layup to make it a score of 76-53. Jack Guindi, from MDY, then would hit three. That looked to be the one that would seal it for MDY, as there were only one and a half minutes remaining. The Tigers continued to fight, though. They then hit two free throws to make the score 79-55. The Warriors then hit a pair of free throws of their own. That would close out the game as the MDY Warriors beat the RZJA Tigers 81-55. Albert Nsiri had thirty-eight points, an unheard of amount in the Cooper Invitational. The folks from the greatest city on earth beat the folks from the Windy City to bring home the trophy.